Добавить в корзину 1 шт. на сумму 25 100 руб. 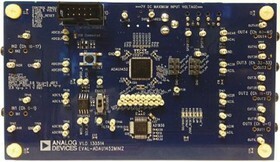 The EVAL-ADAU1452MINIZ evaluation board, from Analog Devices, provides access to the digital serial audio ports of the ADAU1452 and some general purpose I/O. Analogue I/O is provided by the included AD1938 codec. The evaluation board is powered by a 6V DV power supply which is regulated to the required voltages on the board. Its core is controlled by Analog Devices, Inc., SigmaStudio™ software. This interfaces to the board via a USB connection. The EVAL-ADAU1452MINIZ&apos;s printed circuit board (PCB) is designed with 4 layers with a single ground plane and power plane on the inner layers. The evaluation board also has connectors for external analogue inputs and outputs and optical S/PDIF interfaces. An integrated oscillator circuit and on-board 12.288 MHz passive crystal provide the master clock.